Bike UpgradeOn behalf of all of us here at MotoAdventures, "Welcome! and Buenos Dias!" 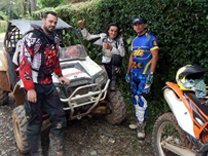 We offer the ultimate in off-road motorcycle tours in the lush tropical terrain in Costa Rica. Please take a tour through our website. Once you have, we're sure you'll be ready to take a real tour with us for the moto-adventure of a lifetime! Our guides have an intimate knowledge of the country, the routes we ride, the culture and the people of Costa Rica. MotoAdventures is about offroad motorcycling but also about experiencing the country and its spectacular scenery. 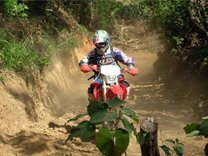 We use KTM 2 stroke enduro bikes,200, 250 they are light, fun, reliable and easy to ride, perfect for the trails in Costa Rica. For our 2, 3 and week tour we use KTM 350 EXC 2918s, 4 stroke bikes, perfect for the riding terrain of Costa Rica.